Vienna. The city that conjures up so many different images. Palaces. Royalty. Music. Orchestras. Waltzes. Sachertorte. Ultravox. But one thing that amazes all visitors to Austria’s capital city is the diversity of architecture across its 23 districts. 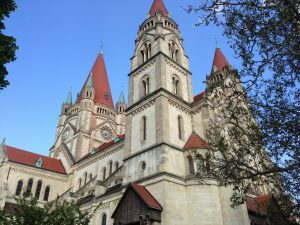 From the early Romanesque churches to the more modern and surreal structures such as the Hundertwasserhaus, a trip to Vienna can feel like a voyage through many different time zones. And all without sounding like something out of a science fiction tale! Not many relics from the pre-Medieval years exist in Vienna today, but traces of the Romanesque period are still here. Although, they seem few and far between. Rupertskirche (St. Rupert’s Church) (in the Ruprechtsplatz streets) is purported to be the oldest church in Vienna, with its curved roofs and stone walls typical of Romanesque architecture. The Michaelerkirche (St. Michael’s Church) located by the Hofburg entrance (Habsburgergasse 12) is another of the city’s few survivors of the early Romanesque period. 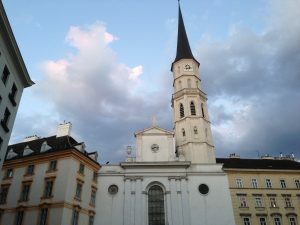 St. Michale’s Church, or Michaelerkirche, is one of Vienna’s oldest buildings. St. Stephen’s Church (or Stephansdom), (in the heart of Stephansplatz), perhaps the symbol of Vienna traverses both the Romanesque and Gothic periods with its great towers standing high over the rest of the city. Dates of construction remain a source of dispute but they vary from any time in the 12th and 13th Centuries. The Gothic spires of St. Stephen’s Cathedral glowing in the golden hours. 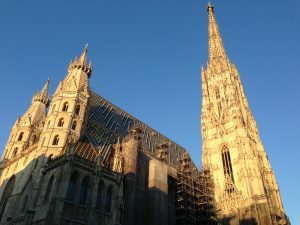 Located ideally in the centre of Vienna, no trip is ever complete without seeing this great cathedral. The spires that typify the Gothic cathedral style of the time stand out like no other and going inside the vaulted arches and crypt that are what you would expect of any cathedral or minster constructed in Europe around this time. Many legends exist about the history of Stephansdom and the construction of its towers. Some say the it was not fully completed because the architect made a pact with the devil. 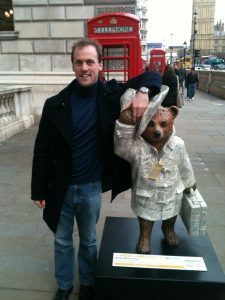 Or that his love for a fair maiden he was unable to hide – partly connected to said pact. 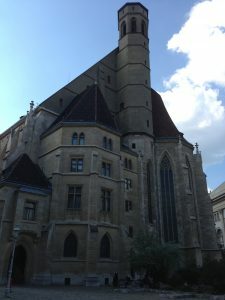 The Minoritenkirche (in Minoritenplatz near the Rathaus) is another such example of the Gothic period. Many of the era’s characteristics typical characteristics are there such as the vaulted arches for the cloisters but parts of it were badly damaged during the Austro-Turkish wars. As a result the roof got replaced and its octagonal shape looks arguably more neo-Romanesque than representic its Gothic roots. Inside, its stained glass windows are stunning and your attention is also immediately drawn to the painting of Da Vinci’s Last Supper that is inside. Minoritenkirche. Gothic with a later neo-Baroque and neo-Romanesque makeover. 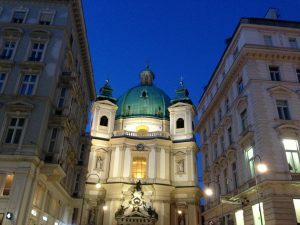 Of course, no article on Vienna could ever be complete without a mention of the royal dynasty who ruled and influenced this city for centuries. 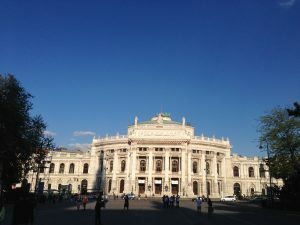 Be it luxurious palaces with beautifully designed gardens or the grand cupola domes of many grand buildings, Vienna is quite possibly the Baroque city of Europe. And consequently many of its great palaces owe a lot to the Habsburgs. The immaculately lanscaped orangery of the Belvedere Palace in Vienna – home of the Gustav Klimt collection. The rule of Leopold I in the second half of the 17th Century was one of the most eventful and productive in this city’s history. 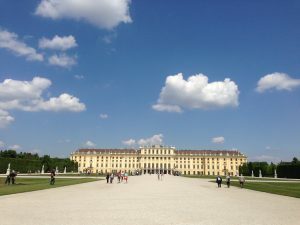 Vienna’s two greatest palaces – the Belvedere and the Schönbrunn were constructed, serving as grand summer residences for different members of the royal family. Designed by Lucas von Hildebrandt and Johann Bernard Fischer von Erlach respectively, these two mini-Versailles today offer a look into the high life of a golden era. View towards the stunning Schönbrunn Palace in Vienna. But it was not only royal palaces that they excelled in. Von Hildebrandt was also responsible for Peterskirche (Petersplatz)which today nestles ideally in a side street behind Stephansplatz, its green and gold dome that couldn’t be more Baroque if it tried, contrasts the Innere Stadt beautifully. Von Erlach drew a lot of inspiration from the Italian Renaissance that inspired the Schönbrunn just as much as the Karlskirche (in Kreuzherrengasse). The Baroque roof of Peterskirche blending in with the centre of Vienna. 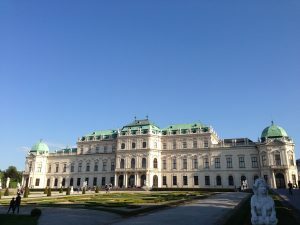 Whilst the inside and the rooms of the Schönbrunn are unashemdly Baroque and rococo symbolising the power and wealth of the monarchy, the exterior had been remodelled into resembling a more neo-classical style upon the inheritance of Maria Theresa. In the 1850’s, Emperor Franz Joseph commissioned the ambitious Ringstrasse project. The old city walls were demolished for a great ring road. The 19th Century was indeed a period of notable “revivals” in architecture across Europe. New buildings constructed with one eye on the past but modernized. Baroque, Romanesque, Gothic, Baroque, Renaissance. Taking a tram across the Ringstrasse shows its legacy. 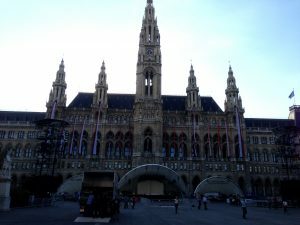 Directly opposite each other on the Universitätsring are the neo-Gothic Rathaus (city hall) and the neo-Baroque Burgthater (National Theater). The former becomes quite possibly the stand out location of the city at Christmas time. A giant ice skating rink along with numerous stalls that bring out the best in the festive season. The latter harks back to a previous Habsburg glory era. 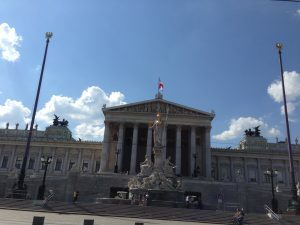 The Parliament (near the Volksgarten) building with its columns and arches fittingly recalls the original democratic institutions of Ancient Greece. The Staatsoper (Opera House) (near Karlsplatz U-Bahn)pays homage to when opera flourished first time round. Franz Joseph’s 1898 golden jubilee heralded construction of a grand neo-Romanesque cathedral. St. Francis of Assisi Church with its interwoven red slanted tiles is an unmissable sight in the Vorgartenstrasse area. Into the 20th Century, new movements in the architecture world were gathering pace. Many of which would influence the changing face of Vienna. Art Nouveau with its emphasis on elegantly curved designs had started to take off in Paris circa 1890. 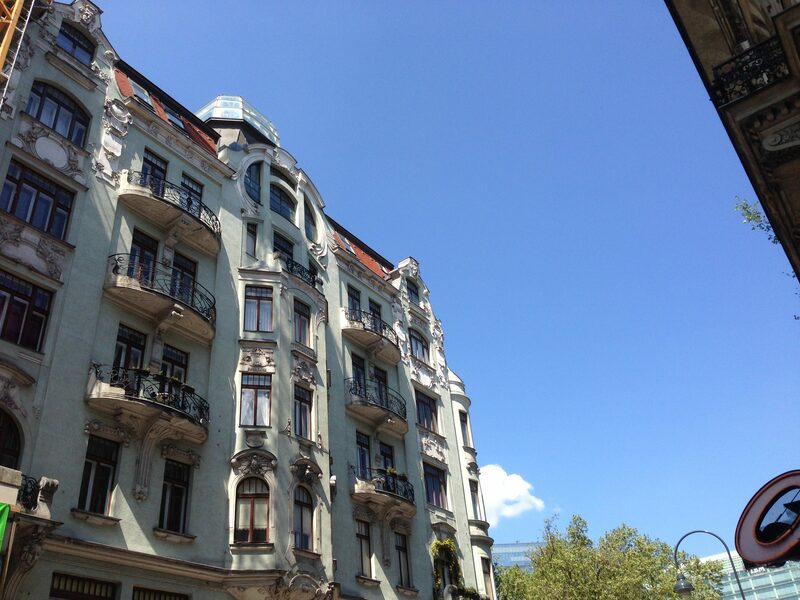 Moreover, Vienna was home to Jugendstil, an off-shoot of Art Nouveau. Its trademark asymetrical curves are seen outside the windows of many buildings in Vienna. Typical example of Art Nouveau influence in Vienna. The interwar period provided a greater need for adequate social housing. Karl-Marx-Hof with its great peach coloured exterior is more than just a block of flats that greet you as you step outside of Heiligenstadt station. A grand housing estate of around 1,400 flats with balconies but also a community in its own right with a laundromat, post office and GP surgery on site. 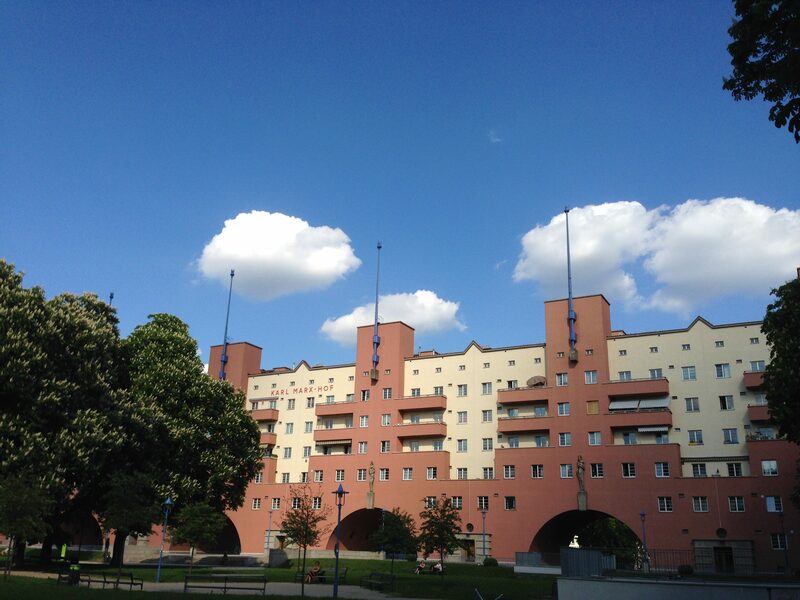 Karl-Marx-Hof, a groundbreaking design that is more than just a housing block. Vienna has also embraced further new ideas that may or may not always be to everyone’s taste. 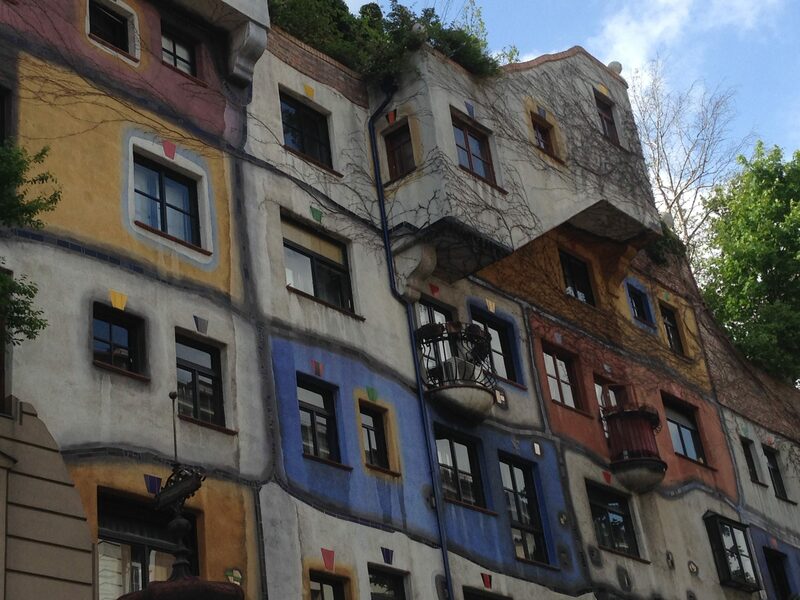 Friensreich Hundertwasser’s self-named Hundertwasser Haus is undoubtedly one of this city’s most photographed buildings. Least not on social media! Curved, colourful and inspired by Gaudi no doubt but posessing an eye on the environment with trees and shrubs around its walls. Who would live in a Haus like this? Back to the centre and the world famous Stephansdom. Though, look directly opposite. On the other side, its great gothic spires reflect on a modern, almost futuristic looking giant curved mirror. But this giant curved mirror is the facade of Haas Haus. A shopping centre and restaurant inside, you wonder if its location was chosen deliberately. An ideal location for the modern and the old to sit side by side. A fitting metaphor for Vienna itself. 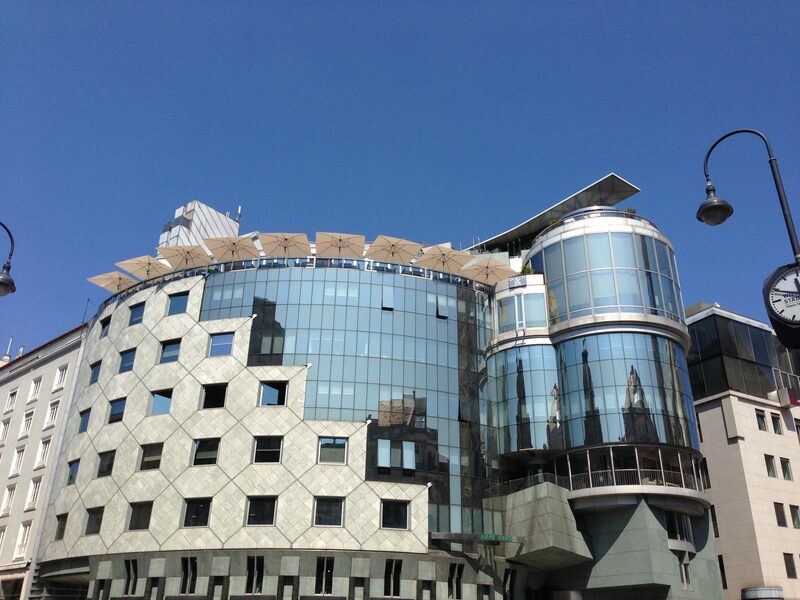 Haas Haus – inspired or inappropriate? You decide. Lovely photographs! 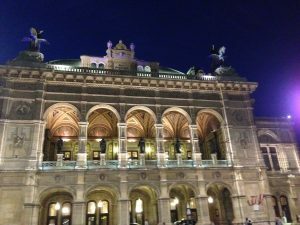 Vienna is one of the most beautiful towns in the world and is on my list for so long. The city’s architecture defines why it’s loved so much. Peterskirche looks mesmerizing.